Vital Records of Weymouth Massachusetts to the year 1850, , at https://archive.org/stream/vitalrecordsofwe02weym . Boston: New England historic genealogical society, at the charge of the Eddy town-record fund, (1910) , Vol. 2, p. 358. Micah Turner was born perhaps about 1709. 1880 United States. Census Office. 10th census, 1880 federal population census, Washington, District of Columbia: National Archives and Records Service, ([19--]) , FHL Film 1254567; National Archives Film T9-0567; Page 99C. John Turney was born perhaps about 1653. Mass. Newbury, Vital records of Newbury, Massachusetts, to the end of the year 1849 (Salem, Mass. : The Essex Institute, 1911), Vol. 1, p. 508. 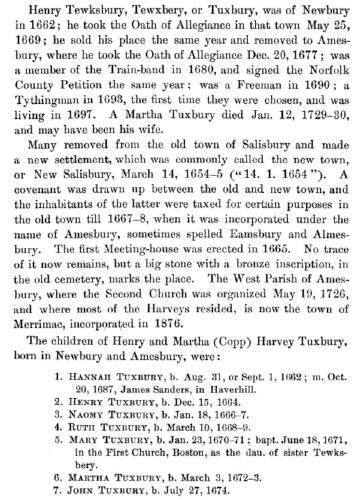 Henry Tuxbury of Amesbury, Mass. was born perhaps about 1626. Vital records of Amesbury, Massachusetts to the end of the year 1849, , at https://archive.org/details/vitalrecordsofam00ames . Topsfield, Mass. 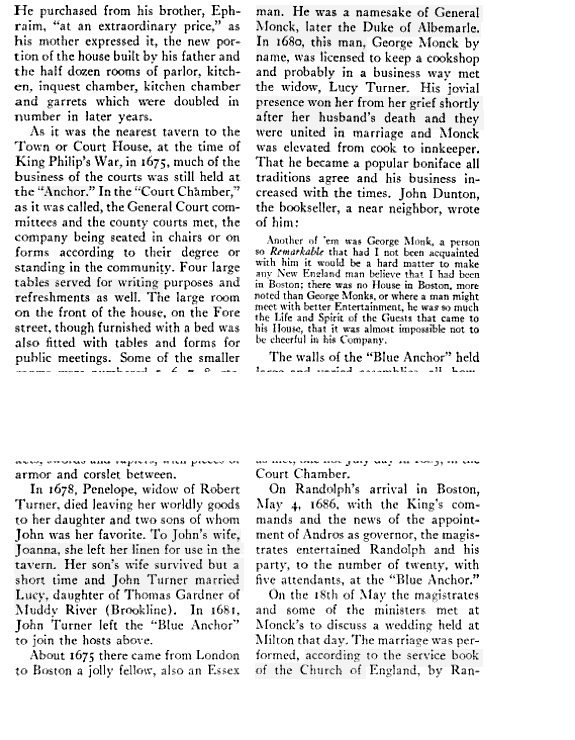 : Topsfield Historical Society, (1913) , p. 240. Mass. Newbury, Vital records of Newbury, Massachusetts, to the end of the year 1849, Vol. 1, p. 531. 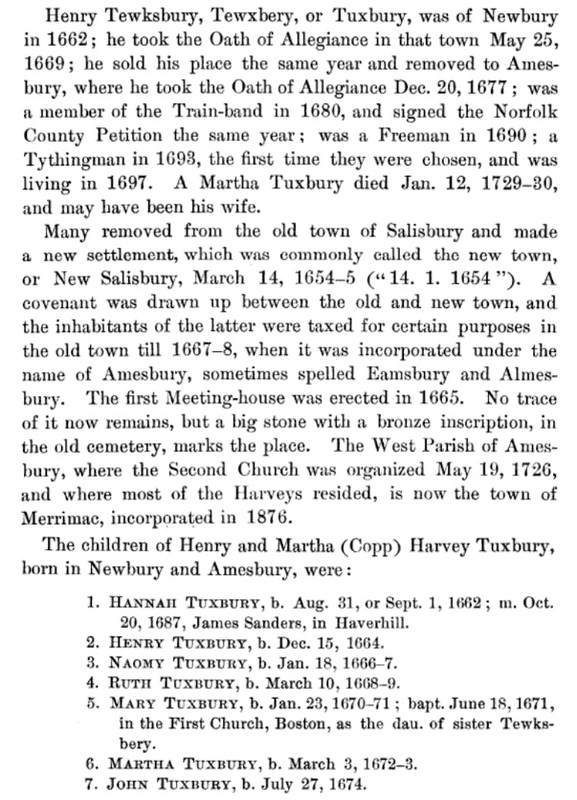 Vital records of Amesbury, Massachusetts to the end of the year 1849, , at https://archive.org/details/vitalrecordsofam00ames . Topsfield, Mass. 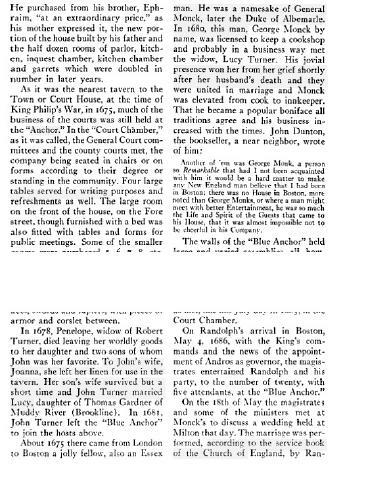 : Topsfield Historical Society, (1913) , p.240.